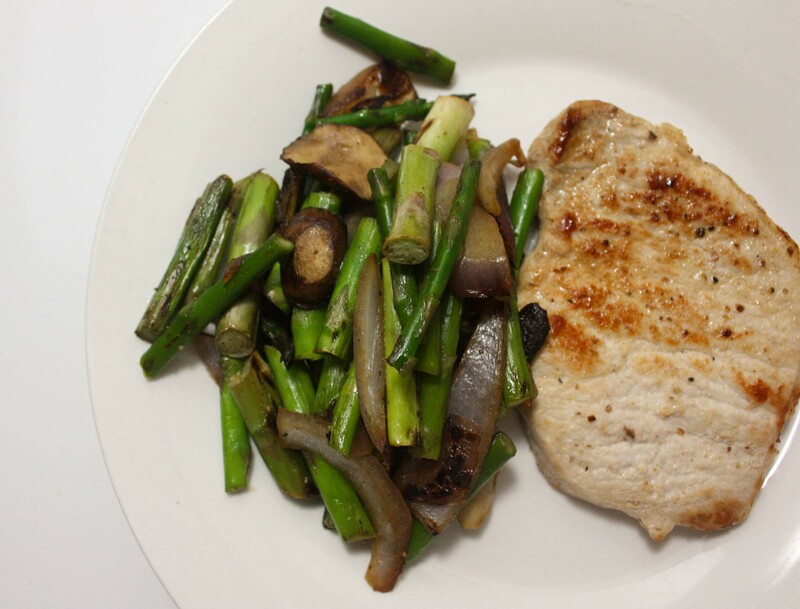 30 Day Paleo Challenge: Day 13. It’s Just Food. 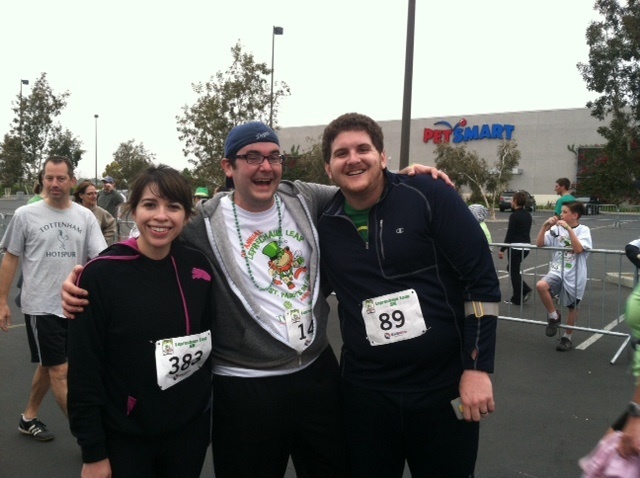 This morning, I woke up and did a St. Patrick’s Day themed 5k with some friends. It was nice, relaxed and fun. At the end of the race, they passed out a bunch of snacks. I’m not really sure what I was thinking but I grabbed a Kind bar, a Think Thin bar and a Gnu bar (all mini sample sizes), along with an apple and banana. 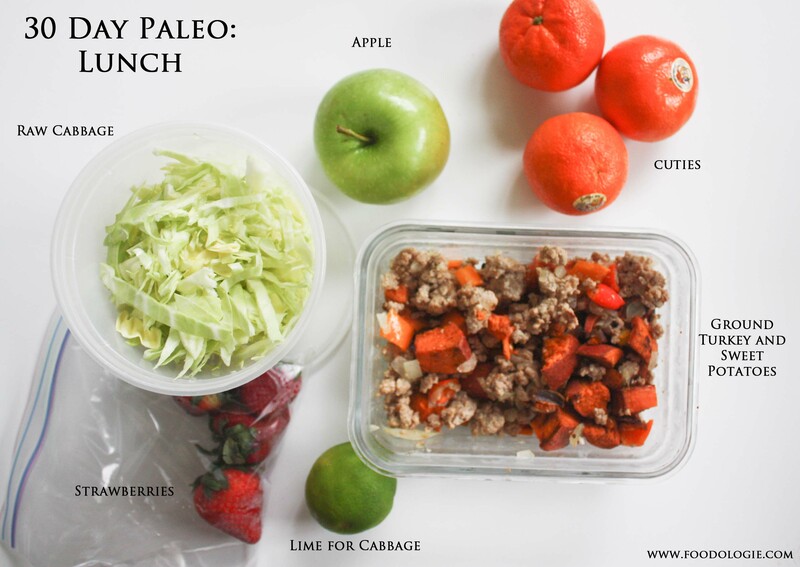 Those bars are totally NOT paleo. But I figured I’d hold on to them for after the challenge. So I came home after the race and had the usual green smoothie and paleo pancake breakfast. That was all good and fine. It was a cloudy day and I had no plans, so I curled up in my pajamas and watched Girls. Around 1pm, I got hungry. 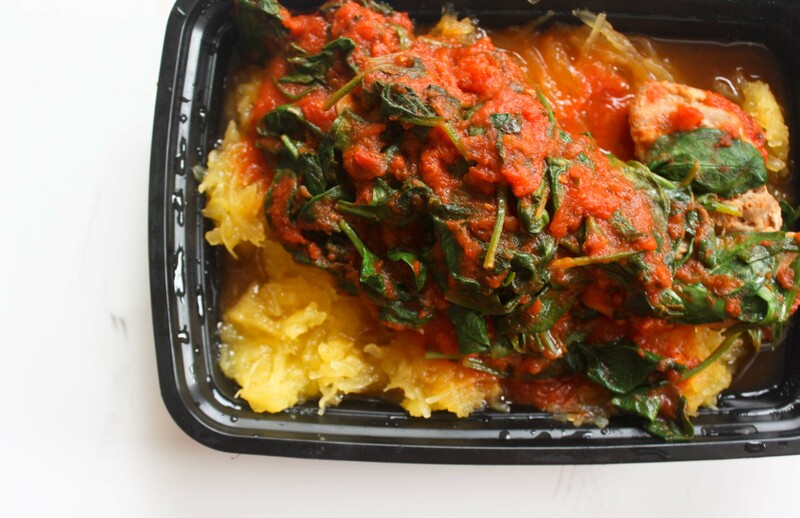 I looked in the fridge and there was a paleo meal waiting for me. Left over pork chops and cauliflower and sweet potato fries. I totally did NOT want to eat that. I also didn’t want to leave the house to get a salad. So instead, I ate the Kind bar, ThinkThin and Gnu samples. Then I had a spoonful of peanut butter with jelly. For a while, I felt bad about it. But then I remembered. It’s just food. It’s NOT a big deal. Some sample bars aren’t going to kill me. Neither will some peanut butter and jelly. For the sake of all female-kind, let’s remember, it’s just food. No matter what our relationship to it is, it’s just food. Eating the “wrong” thing shouldn’t make me feel bad. So I’m over it. I messed up. Last night, I also had a few bites of Pad Thai. Then I had a massive stomach ache. Karma? No. I probably ate the Paleo-friendly coconut soup too fast. That’s it. 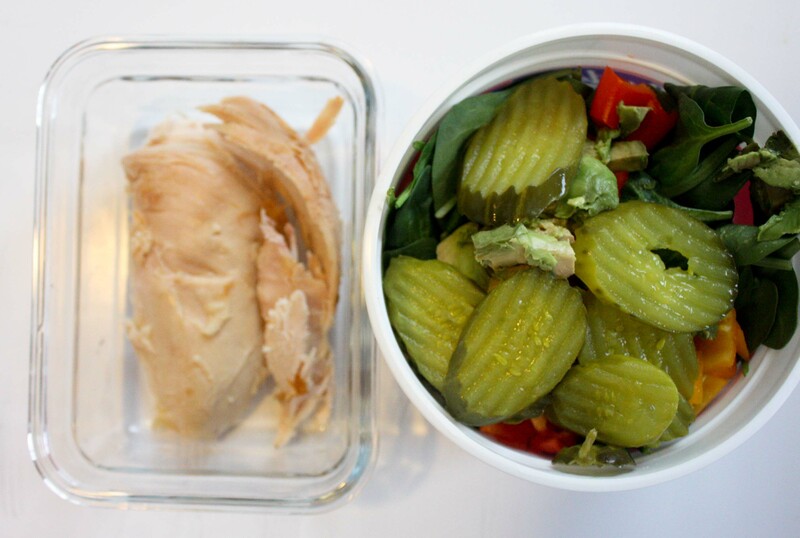 Do you feel guilty after a diet mess up? Should we? Thoughts? Two nights ago, I made a super tasty dinner. I’ll tell you about it because it was also day 11 lunch. Seriously, it was ready in about 15 minutes from start to finish, and I thought it was pretty tasty. That’s all you need. 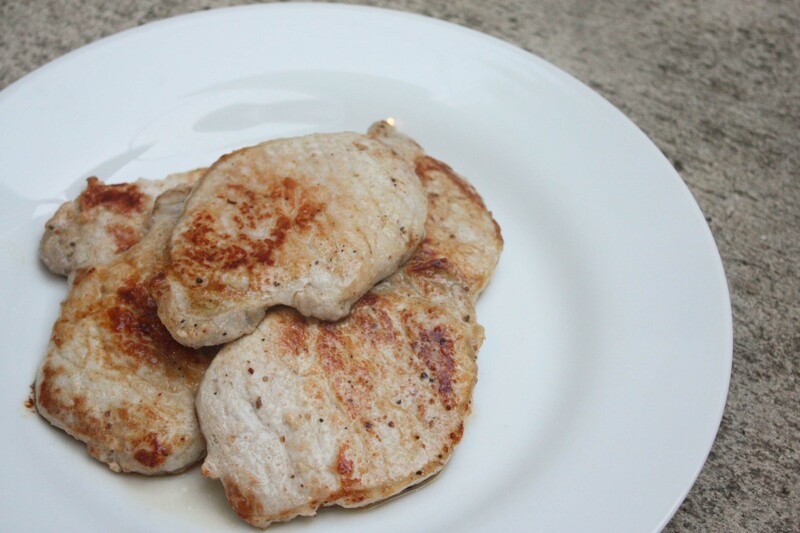 Season pork loin with salt, pepper, and garlic powder. Heat some oil (about 1/4 a tbsp is good for 5 pieces) in a pan on medium/high heat. Add pork. Cook 2-3 minutes per side. Set aside. Add vegetables to the same pan. Season with salt, pepper and garlic powder. Sautee until tender. Serve and enjoy! *I used the asparagus stir fry mix from Trader Joe’s, but I won’t lie, while it’s convenient, the asparagus was really tough. A lot of it was the tough ends that I would cut off on asparagus. Half the time I felt like I was eating twigs and branches, so maybe steer clear of that? 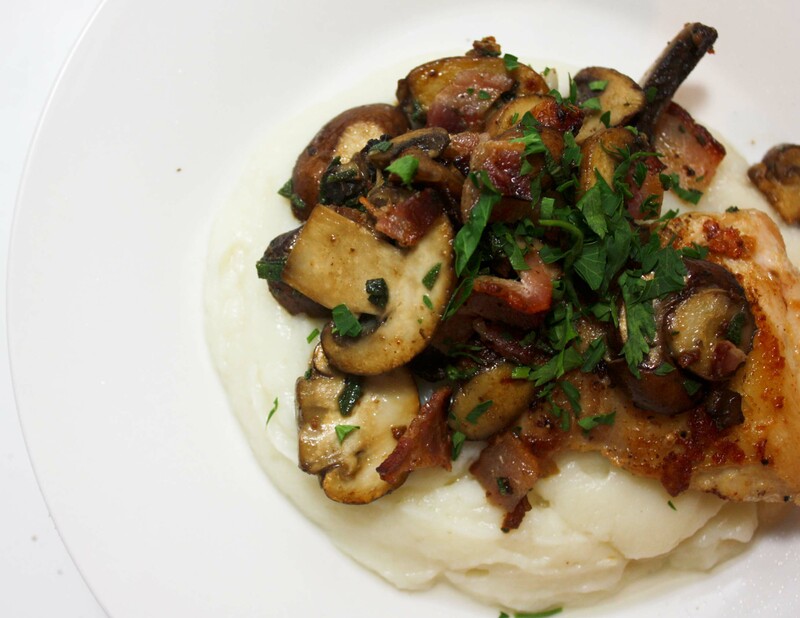 Quick, easy and tasty. And I always make too much for one person, so there were plenty of leftovers. Day 11 was an interesting day. Apparently, March is the month of Karla trying new things, because I went to Bikram Yoga for the first time. My co-worker talked me into going with her, since they offer new students 2 weeks of unlimited classes for $20. I figured why not? So the studio is located in The Camp (if you’re an OC local), and it was interesting. I’ll start by saying, the place is stinky, which is totally expected given the heat and sweat and warm bodies. Definitively, not cute. I had been having anxiety all day about it. I thought for sure I would die. But good news, guys! I didn’t die! In fact it was sort of fun. I’m not sure I love it, but I’ll definitely have to give it another try, especially since I’ve got two weeks of classes. I will say I came home with a pretty bad headache that lasted pretty much all night and an overwhelming desire to take a shower. I don’t think I’ve ever been that sweaty in my life. 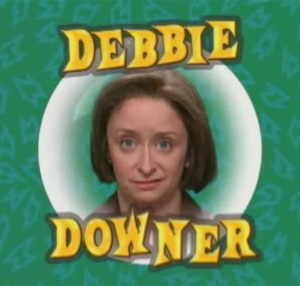 As a self-proclaimed “yoga hater,” I’ll say I definitely enjoyed it more than I disliked it. After a much needed shower, I surprisingly wasn’t hungry! Can you believe it? 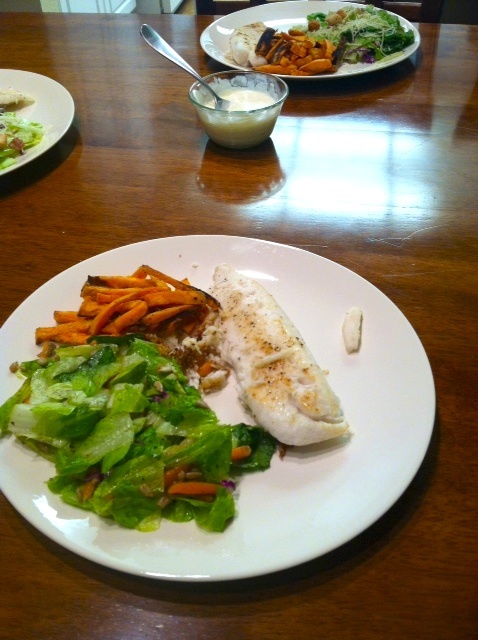 So I decided to make a dinner that takes a while and it included sweet potato fries! 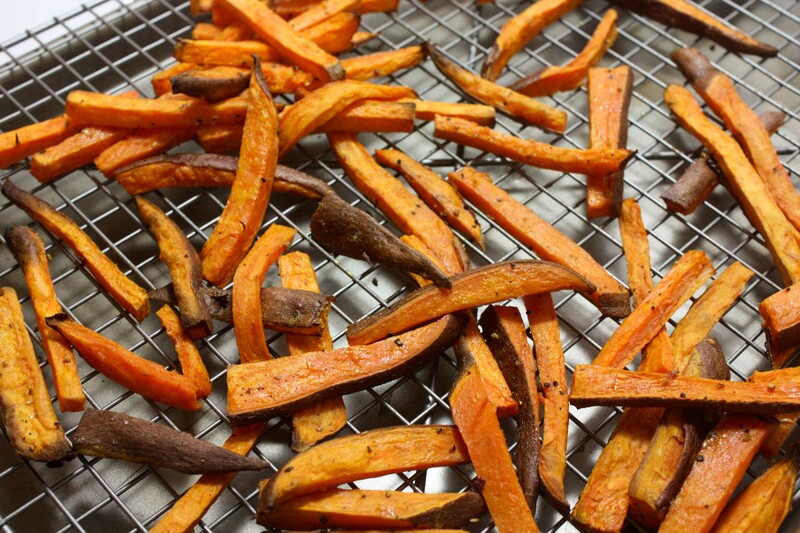 Apparently I’m late to the game, but if you cook your sweet potato fries on a cooling rack (over a baking sheet that is) you get crispy, evenly baked fries! Who knew? So along with my tasty, crispy fries, I had cauliflower puree (because I’m OBSESSED) and some rotisserie chicken left over from Sunday. Delicious. Simple. 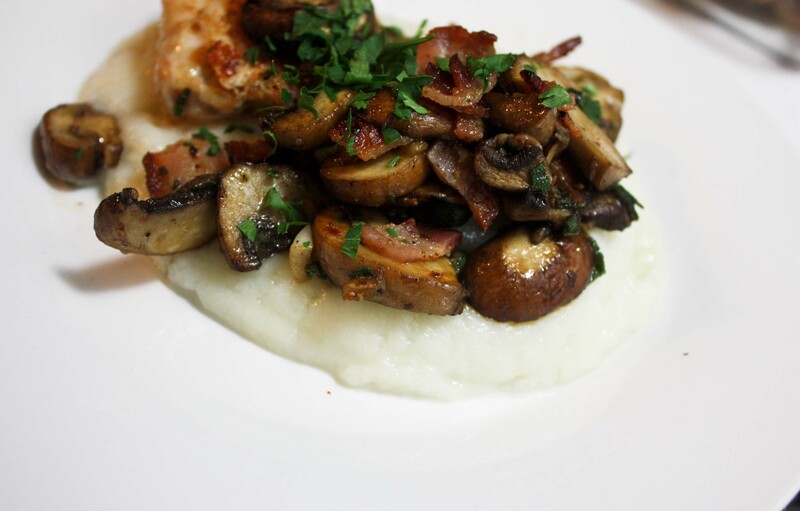 I swear the cauliflower puree was the tastiest thing on the plate! 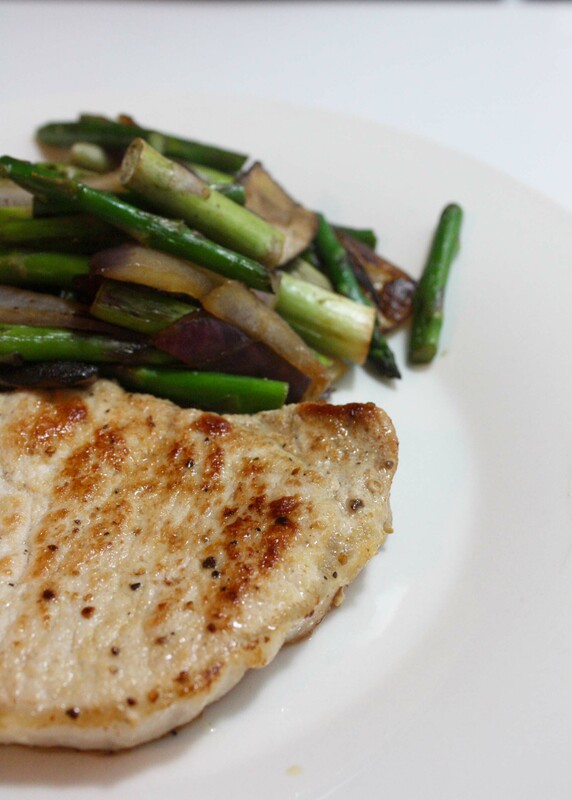 On nights like this, when I’m not starving and I have a tasty dinner, I might even like Paleo… That’s probably because it just feels like I’m eating normal food I like, not making myself eat one thing when I really want another. Have you ever tried Bikram Yoga? Love it? Hate it? 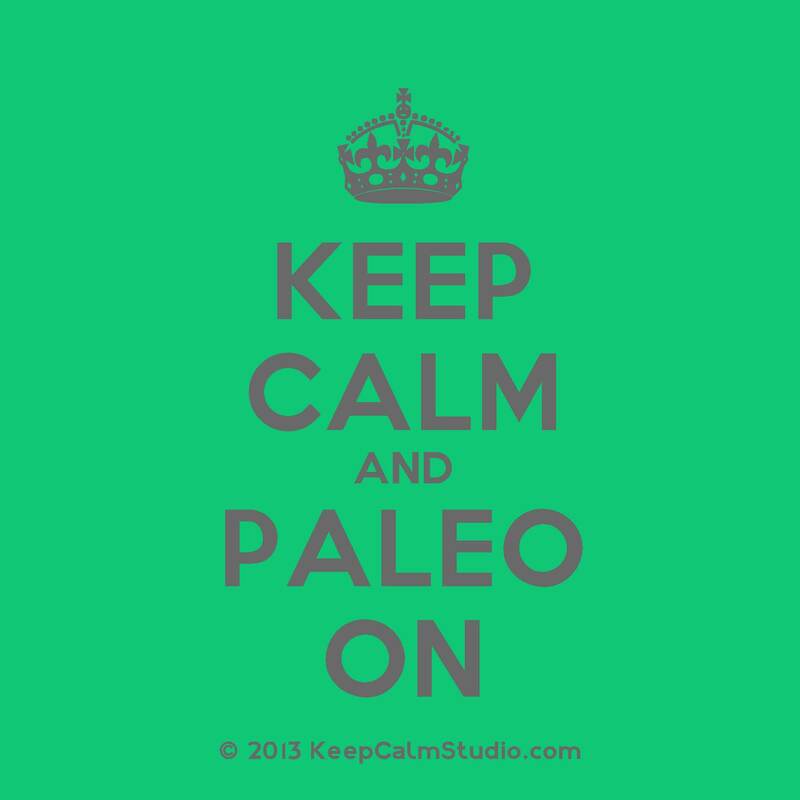 It’s been one week since I started the 30 Day Paleo Challenge. I’m hungry all the time. Seriously. I’m hungry ever 2 hours and ravenous every 3 hours. Honestly, it’s just not fun. Not to mention, a lot of times, I’ll eat and when I’m done, I feel like I haven’t actually eaten. 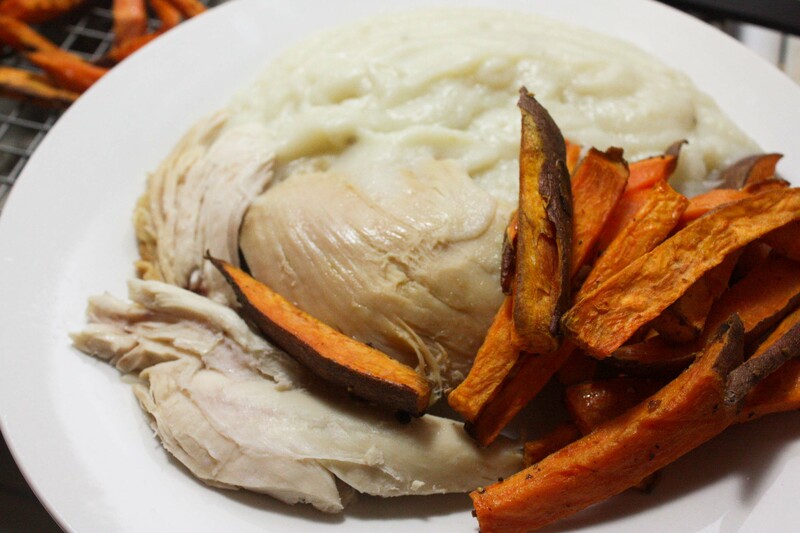 I’m not sure if I haven’t been eating enough fat or sweet potatoes, but this weekend it felt like a minute didn’t go by when I couldn’t have eaten a huge plate of food. My skin is NOT clearer. I realize it’s only been a week, but I actually feel like I have more breakouts around my mouth/chin. This might not be tied to diet, but just pointing it out. I don’t have tons of energy. I will say, the mid-afternoon sleepies have gone away. So that’s a plus! But this weekend, I was just exhausted all the time. Maybe because I just didn’t sleep well this weekend? Not sure this has anything to do with diet. I think I was just super sore from crossfit on Friday and couldn’t find a comfortable position all night. I still want sugar. Not all the time, actually I realized that having a real, filling meal makes me less likely to want something sweet afterward. But last night, all I wanted was a brownie covered in ice cream. I lost 1 lb. I guess I can’t complain about this, since weight loss isn’t my number 1 goal, but for the amount of time that I’ve spent being hungry, you’d think I’d at least have lost more than 1 lb. So obviously, 1 week is not long enough to truly reflect on whether or not this is a lifestyle I like. Right now, most of my thoughts are probably a withdrawal symptom. Unfortunately for me, the biggest negative is that because of the above points, I’ve been in a terrible mood lately (particularly this weekend). Honestly this has been my biggest motivation to quit. 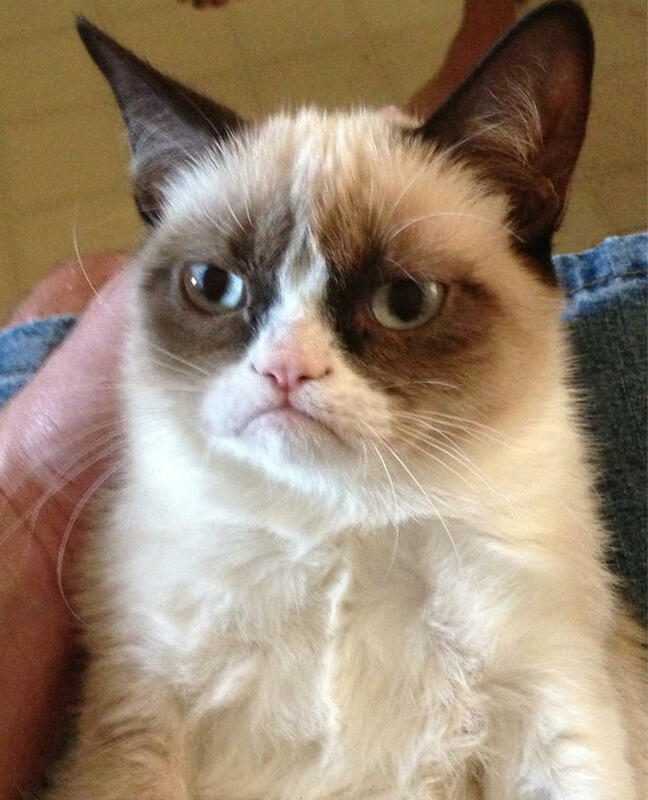 I’m generally a happy, positive person, but apparently when I’m hungry I turn into grumpy cat. I’m not trying to discourage anyone from trying Paleo, but I want to paint a realistic picture based on my own experiences. It hasn’t been all rainbows and unicorns over here. That said, I’m not quitting yet. Just writing down my thoughts and hoping it gets better. How about you? 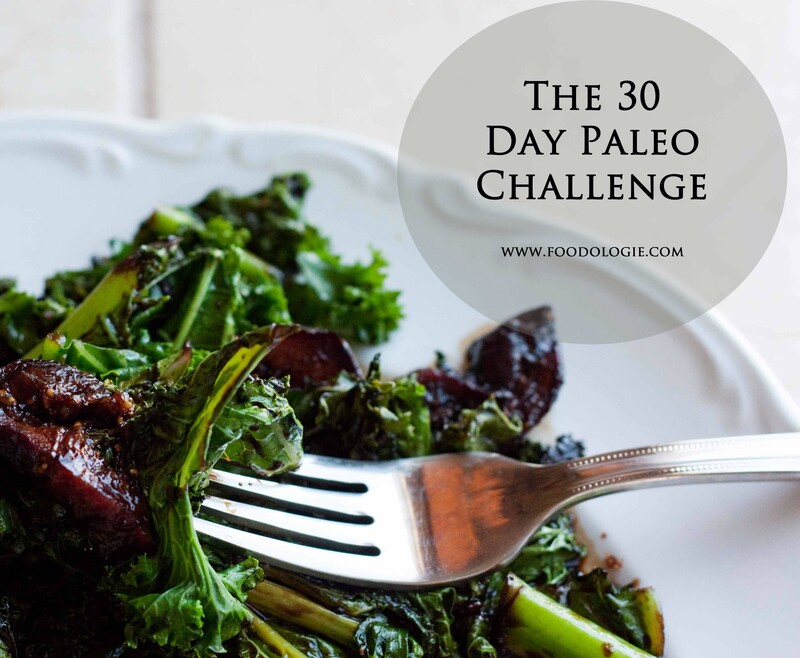 Have you tried a paleo challenge? How’d you feel after 1 week? But the last few days I’ve been easing into it. 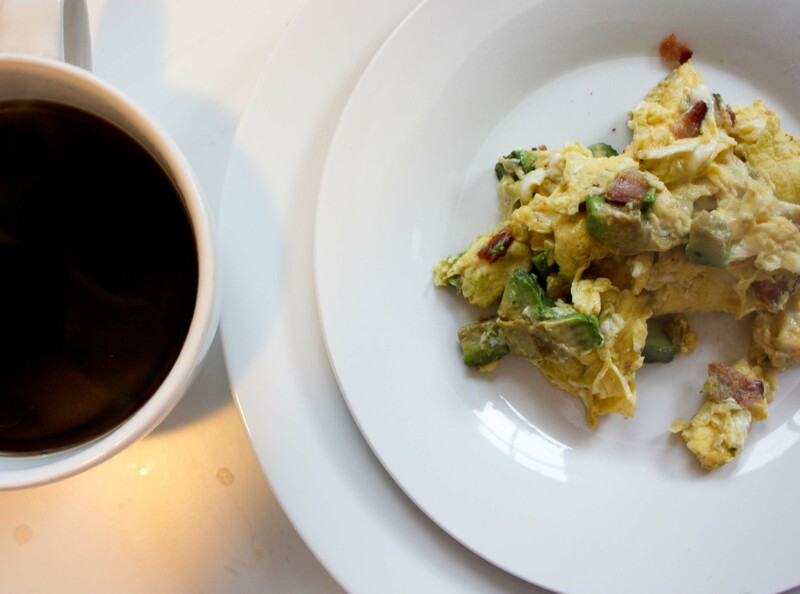 Breakfast was full paleo this morning. 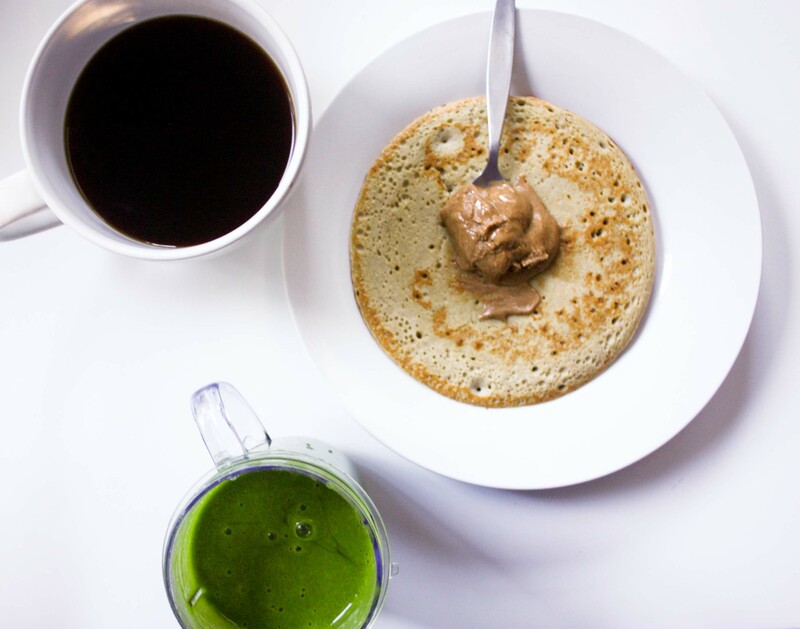 Let’s talk about the Paleo Pancake. I discovered this on Carrots N Cake a while back and have been eating it for a few months. I’ve seen it around the web as well, but I finally found the combo (and method!) that I think is the tastiest. Slice the banana and put it in the magic bullet cup. Crack the egg in there as well. Add the vanilla. Blend until smooth. Alternatively you can mash the banana and just mix it in a bowl, but I found that the magic bullet really made it smoother and tastier. Heat a small skillet (sprayed with a bit of cooking spray) over medium heat. Add the batter and turn the flame to low, cover with lid. Cook about 3-4 minutes until you shake it and it no longer giggles (it takes a bit of time). Flip and cook for an additional minute or two. 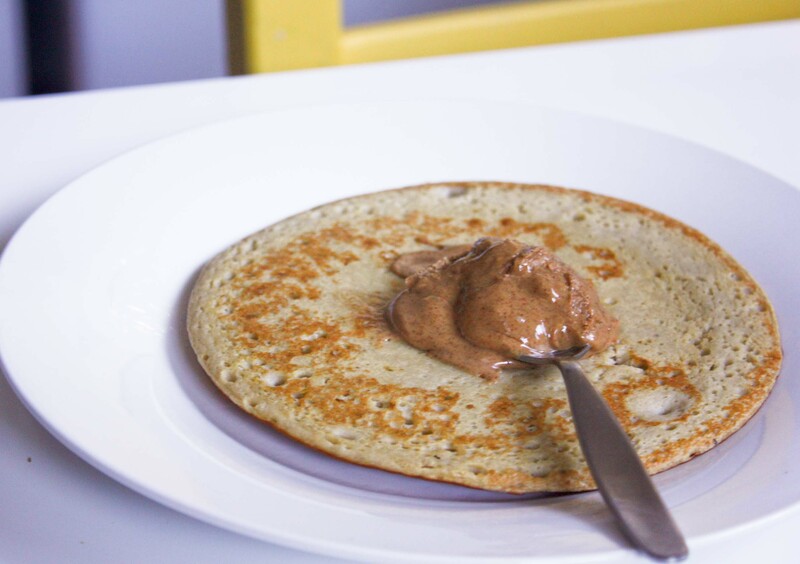 Turn onto a plate and slather with almond butter! Delish! *the other 1/4 of your banana can just be sliced on top or used in a green smoothie! I found that if you put too much banana then your banana to egg ratio is off and the pancake breaks. 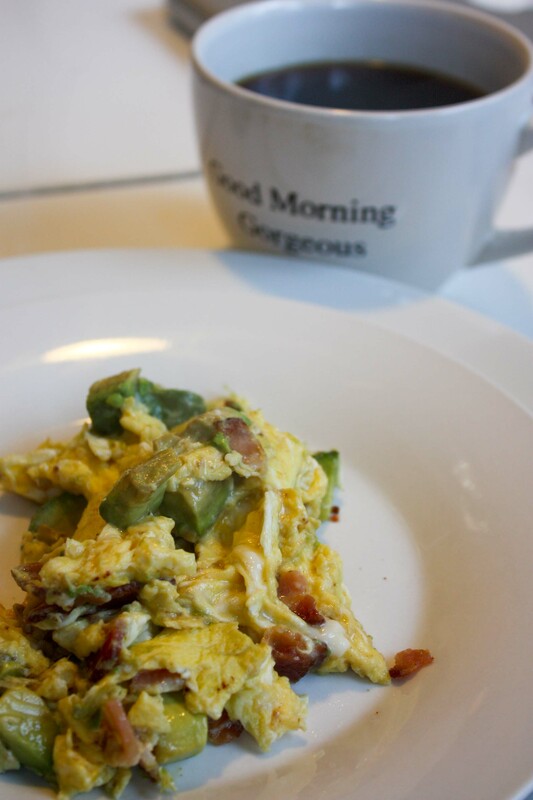 I’ve also tried with 2 eggs and that just tastes too eggy to me, but try it if you’d like! I used to think my Magic Bullet was totally useless, but now I’m finding new uses for it! Also I should note… Please please please don’t expect this to taste like a regular pancake. That’s just impossible. But it is tasty and definitely worth a try! Not to mention that it kept me full for a really long time. 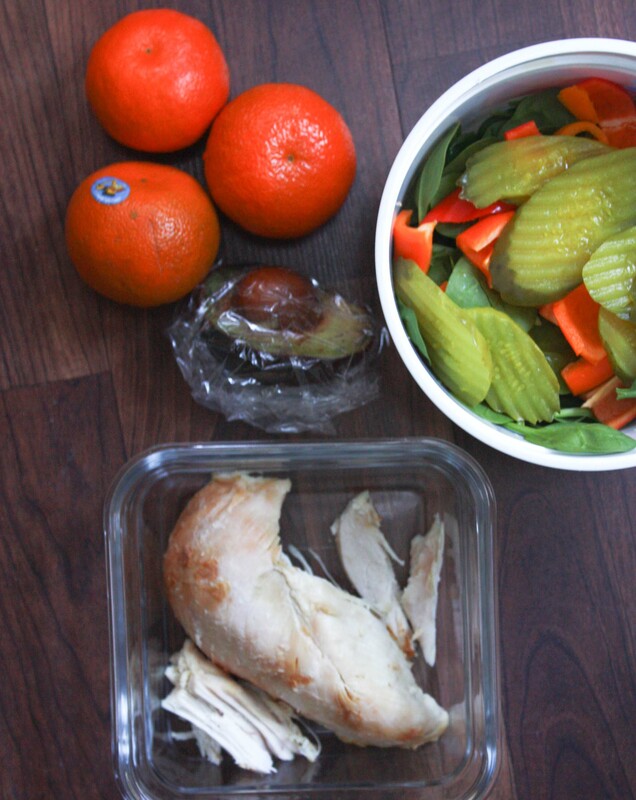 For lunch, I packed some spinach salad with peppers, pickles and avocado, left over rotisserie chicken, and cuties. For dinner, I’m headed out. I semi-feel like I’m going out of mainstream eating with a bang. This week is OC Restaurant week. So I’m going to dinner to celebrate some friends’ birthdays at Newport Landing. Surprisingly the thing I’m looking forward to is NOT dessert! This Potato Wrapped Atlantic Salmon sounds aaaa-mazing. What’s on your agenda for the night?